The location of the hill has been determined by Harley G. Shaw and mentioned in his article “Wood Plenty, Grass Good, Water None.”* Shaw has determined that their campsite was near Nagiller Tank. 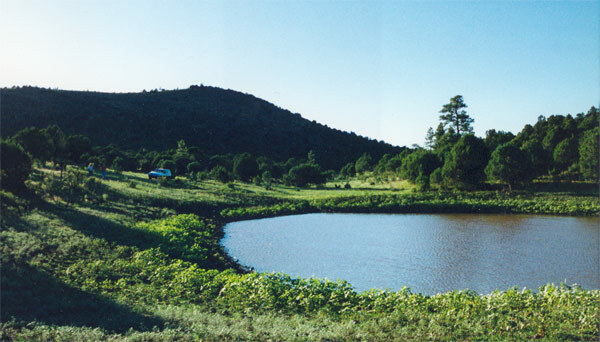 Nagiller Tank. Tom Jonas photo. Topographical Hill from the north. Tom Jonas photo. They must have reached Hell Canyon near where the Bill Williams Loop Road now crosses because at this point the canyon turns southwest. If they had reached it much farther upstream the creek would be flowing magnetic west. Four miles west on a sinuous trail along the edge of Hell and Devil Dog Canyons would bring them near Nagiller Tank. 2. At this point Whipple will be looking for a good observation point to see if this creek will take him west or southwest to the Colorado River. I first assumed that he would have traveled to the west edge of the plateau via the open prairie (north half of section 29, T21N, R1E). This would have brought him to Nagiller tank from the north or more likely to a different campsite a mile or so north of Nagiller. To investigate this possible alternate campsite we climbed the 6671 ft. peak about a mile north of Topographical Hill and above Flat Mesa and found an extensive view to the west but no view of the course and mouth of Hell Canyon to the south. The campsite to the north, and its corresponding hills therefore, do not fit Whipple’s description. This hill to the south fits the 6775 ft. southeastern extremity of the proposed Topographical Hill, which is about ¼ mile south on the map but closer to ½ mile in climbing distance. 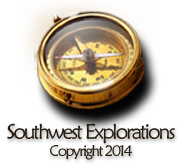 From here Whipple could see the course of Hell and Devil Dog Canyons, and all the country to the south and southwest. The base of the ridge of Topographical Hill is a little over one half mile west of a their bivouac, assuming the camp was below Nagiller Tank. Climbing to the north or south summit, however, would probably require closer to a mile of travel. The Nagiller ravine is the only north-south ravine in this area that is adjacent to hills that fit the descriptions of Whipple and Tidball. 5. Beale’s and Whipple’s maps show the party cutting across the southern edge of a feature which may be Flat Mesa. This would require that they descended from the plateau near the north end of Topographical Hill. Comparing the two maps below, however, it occurred to me that the feature that I labeled “Flat Mesa” on the Beale map actually fits the position of Topographical Hill better. Since Whipple’s diary does not mention Flat Mesa it seems more likely that Beale (who had probably not personally visited the spot) would depict Topographical Hill on his map. 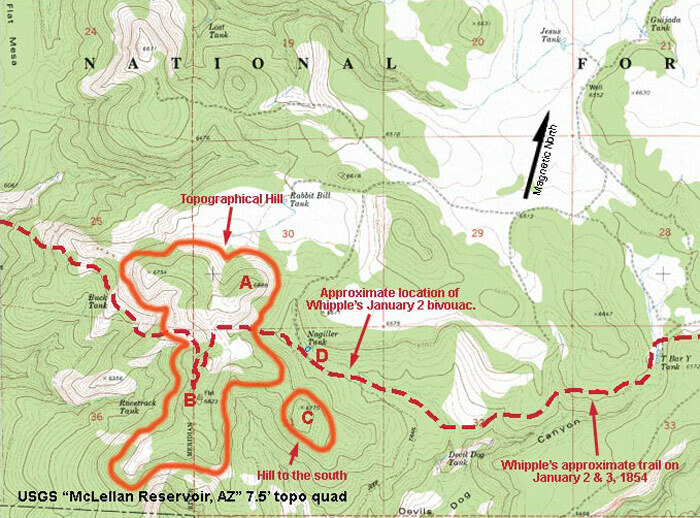 If Beale’s map shows Topographical Hill and Whipple’s map shows Flat Mesa (with a black dot on the trail about where Topo Hill would be), then the two maps agree nicely with each other and with the route Whipple described. (Left) Beale’s preliminary map. (Right) Whipple’s map. The party likely climbed the ridge to the saddle area due west of their camp and then climbed either the 6888 ft. north summit or the 6823 ft. south summit of the ridge for a better view. After carefully observing the sweeping view before them they picked their way down the west flank of the mountain toward Ash Fork. 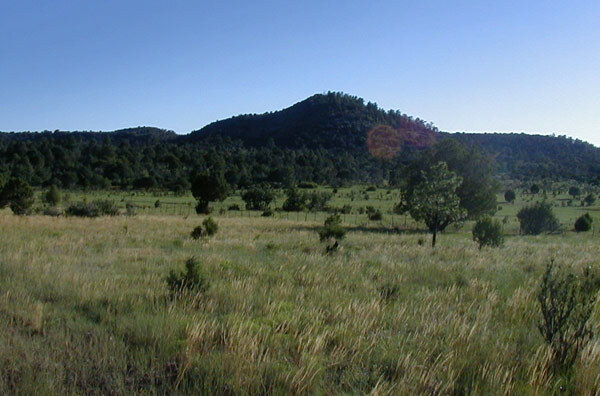 *Harley G. Shaw, Wood Plenty, Grass Good, Water None: Vegetation Changes in Arizona’s Upper Verde River Watershed From 1850 to 1997, United States Department of Agriculture General Technical Report RMRS-GTR-177, September, 2006.